No matter how hard I try to prevent it, it always happens: post-race weekend depression. This year's Shamrock Marathon Weekend was no different; I am super sad it's over! In a nutshell- friends, PR's, family, and beer. AKA, awesome. It was my first distance race and my first multi-day challenge since September and my feet survived! And my brother ran his first half marathon! Look for recaps coming this week. Saturday- Shamrock 8k, 57:29- new PR! I really would have liked to worked out more last week but it just didn't happen. I had wanted to rest, just not that much. I want to do a better job of cross- and strength-training each week; I've just got to get a better routine going. Since last week was a race week, nutrition and hydration were very important. This was probably the first race that I felt adequately hydrated for. I aimed to increase my water intake by about 25% each day and I felt like I reached that goal every day. Also, since I'm still not 100% sure that I don't have gout, I avoided any foods that would cause a flare-up: beef, pork, caffeine, beer, etc. Overall, I'm proud of how I prepared for last weekend's races. 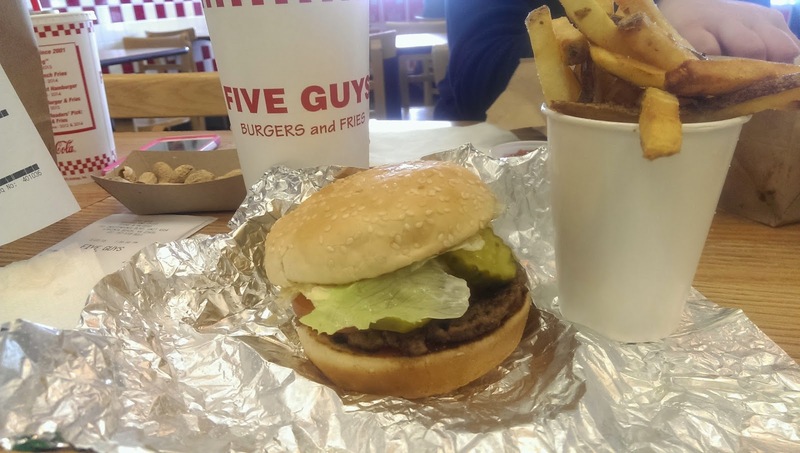 And I'm also really proud of how I celebrated after the races: Five Guys! If you don't know the goodness that is Five Guys Burgers & Fries, I'd highly suggest you try it once or twice. I hadn't ate there in over four years but on Sunday, I had the BEST burger and fries I'd had in a long time- to the tune of 28 Weight Watchers points (daily goal is 26). But it was so completely worth it. On the left: January 2013, one week before I joined WW. 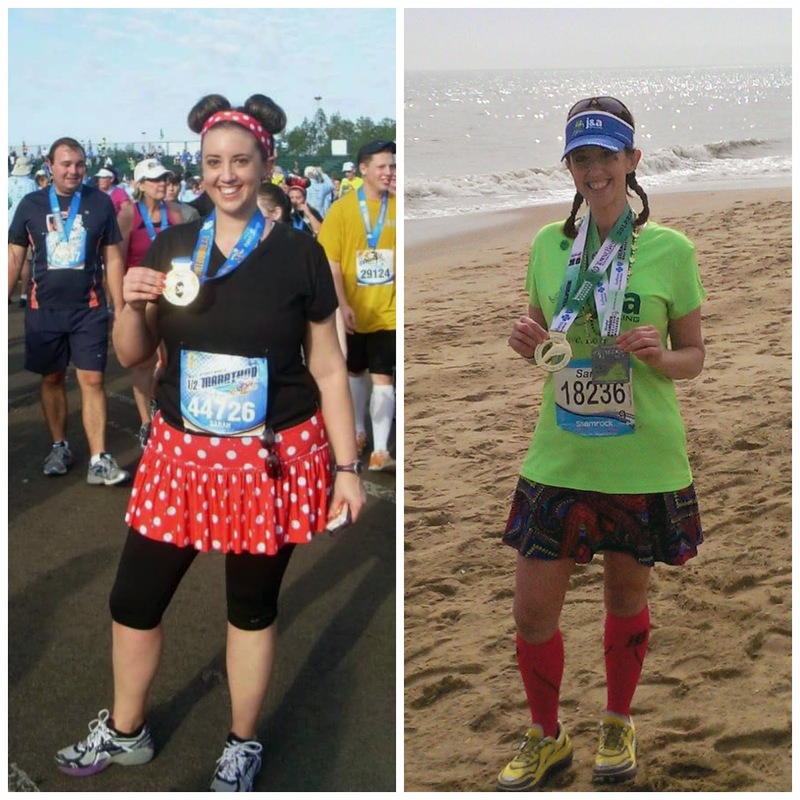 On the right: March 2015, Shamrock Half Marathon. You look AMAZING and its clear that you hard work and "slow and steady" approach to the weight loss is really working. It was so great to see you this weekend, and celebrate with you after both races. Congrats again on your 8k PR and your first post-injury half! Thank you, Kathryn! It was great to see you too- Congrats on your major half PR!! YES! I could not wait to get the 50lb charm! It is SO motivating :-) Congrats to you on your weight loss- keep up the good work! Congrats on the PR and reaching the 50lb milestone! Thanks, Jen! I'm so glad we got to meet in real life last weekend! Congrats on a PR race and of course the biggest accomplishment of all, the 50 pound weight loss. So proud of you Sarah.